Bury St Edmunds and Colchester both won promotion on Saturday, a great achievement for both clubs. The hype and expectation had been building for weeks and on the day all teams involved didn’t disappoint, but what impressed me most was the way the game’s Core Values shone through demonstrating what a great sport we are lucky enough to be a part of. In the days before the games Facebook and Twitter were peppered with goodwill messages between members of Bury and Colchester and from clubs in Eastern Counties and beyond. I went to Eton Manor on one of Colchester’s supporters coaches and the atmosphere was one of optimism rather than expectation knowing that the whole season had been leading up to this winner takes all game. When we arrived at the exotically named ‘The New Wilderness’, Eton Manor RFC’s ground off the not so romantic Nutter Lane, there must have been 200 Colchester supporters with 90 minutes to go until kick-off. The ground was bathed in bright sunshine and there were barbecues and bars installed outdoors to keep both sets of supporters that weren’t at the pre-match lunch fed and watered. 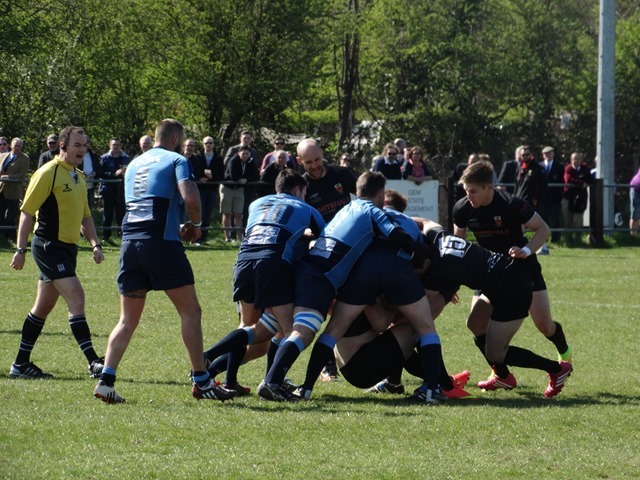 Crowd estimates at Bury St Edmunds and at Eton Manor were between 1000 and 1500, their numbers swelled by members from other local clubs eager to see some top class rugby. The game was being covered by BBC Essex and those who were late arriving were getting regular updates on the radio. As kick-off approached at Eton Manor there were about 450 supporters from Colchester with hardly a space to be seen around the fence around the pitch. Despite the amount of alcohol that had been consumed there was nothing but mutual respect between the opposing sets of supporters who were talking about previous encounters between the clubs, the forthcoming world cup and of course who would come out on top in this encounter, although as you would expect there was an appropriate degree of banter. Match reports will be available on club websites although I was very impressed by the Colchester Gazette having a report on its website with two hours of the game finishing. Briefly, Colchester looked the better side with the ball in hand in the first half and despite falling behind to a penalty, a Calum Irvine try gave them a 10-6 lead at half time. Early in the second half Colchester’s forwards got the ball over the line to stretch the lead to 15-6 and there was a feeling amongst the away supporters that this was going to be their day. However they didn’t bank on the tenacious Eton Manor players who battled away showing why they had been in the top two in the league all season. A home try mid way through the half made the score 15-11 but crucially, Colchester managed to control possession for the next ten minutes or so until they were awarded a penalty slotted over by Dave Higgins to secure a seven point lead. The drama wasn’t over as Eton Manor scored again, the conversion levelling the scores setting up a nail biting last five minutes. Colchester hung on, the draw being enough to win promotion with Eton Manor having to play-off against Chobham next week. I managed to take a video of the last few seconds of the game and when the final whistle blew Colchester supporters ran on to celebrate, surrounding the team. What is significant for me is that you can see a number of the Colchester players manageing to escape the melee to go and shake hands with the opposition in a display of sportsmanship and respect that is such a big part of our game. In terms of discipline the game itself did not have any flashpoints that I could see and no obvious elements of foul play, the only yellow card coming with two minutes to go when a Colchester player deliberately slowed down play. The big crowd were noisy but supportive, with only an ignorant few criticising the referee (who controlled the game well) every time a decision was given against their team. Afterwards, supporters congratulated and commiserated with each other and then the conversations continued until it was time was the Colchester support to get back on the transport to take them home. Colchester Rugby Club was booked for a private function but someone had the foresight the book a room at Colchester United’s stadium up the road where the celebrations continued. All through the day I had been getting updates from Bury St Edmunds and people were coming up to me during and after the game for news from The Haberden. There was genuine pleasure when I told than that they had also been promoted. A great day for Bury St Edmunds and Colchester and a great day for the game of rugby, demonstrating that however important and tense the game, it’s Core Values of Teamwork, Respect, Enjoyment, Discipline and Sportsmanship will always shine through.